This is the latest in a series of book reviews I do for the Viral Blogger’s Network. Free books if I will read and review them – yeah, I’m in! David Rudel’s Who Really Goes to Hell? 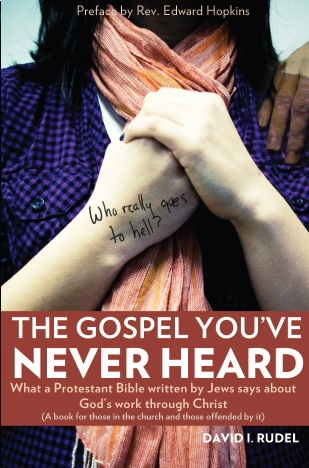 The Gospel You’ve Never Heard is an interesting read, though I don’t recall that it ever gets around to answering the title question. Don’t let that get you down, however; Rudel offers at least this answer to his question: according to the Bible, it is not as cut-and-dried” as typical American Evangelicals would have us believe. I found the argumentation and discussion of Rudel’s perspective enticing and adventurous; having also come up with some conservative-evangelicalism of my own, I know how much of a challenge he is up against to re-frame questions as well as scripture. Here is Rudel’s main point: Jesus doesn’t teach the “modern Gospel” of salvation by faith alone. His solution, as far as I can figure it, is to differentiate between salvation and judgment. Salvation is renewing of life available through the gift of the Holy Spirit. Judgment is an accounting at the end of time for what one has done with one’s life. I found the book provocative but was only able to read it comfortably with an open bible along side. Most of his citations encouraged me to look at the context. If you have ever thought the Gospel was as clear as Four Spiritual Laws, this is an excellent book for you to read and wrestle with. Advice: More Blessed to Receive than to Give?